The Sarah Steinmetz era has officially begun at Rochester High School. Steinmetz, who took over for Lauren Duquette (now at Marian), picked up her first in conference last night, as Rochester knocked off Berkley at home. 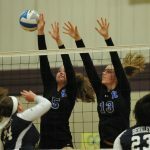 The Falcons won the match in three straight sets. Rochester will return home next week. 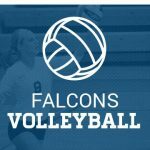 The Rochester Volleyball season went very well for the Falcons, going undefeated in conference play, and winning their first conference title is several years. 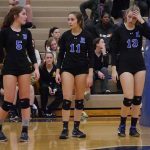 The following players were selected All-OAA: Maya Gilgenbach, Sydney Jones, Ryan Allor, and Maddie Halsey. Also bringing home more post-season accolades is senior Maddie Halsey, who was named MIVCA All-Region 16. 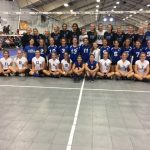 Article Courtesy of MIPrepZone Eisenhower coach Caitlin LaPratt said the Eagles’ balance has been crucial to their success all season. 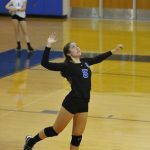 “We have a couple go-to hitters, but if they were to have an off night we have a lot of variety in our offense – we have other people we can go to,” LaPratt said. Rochester opened district play against Utica at Stoney Creek High School on Tuesday. 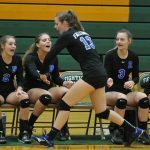 The Falcons knocked off Utica in three straight sets, to set up a district semi-final match up with Utica Eisenhower. Rochester will take on Ike on Thursday at 5:30pm at Stoney Creek High School.